This is a surprisingly delicious autumn treat that happens to be healthy, nutrient-rich, refined sugarfree and glutenfree. It’s also dairyfree if you replace the skyr with vegan yoghurt. 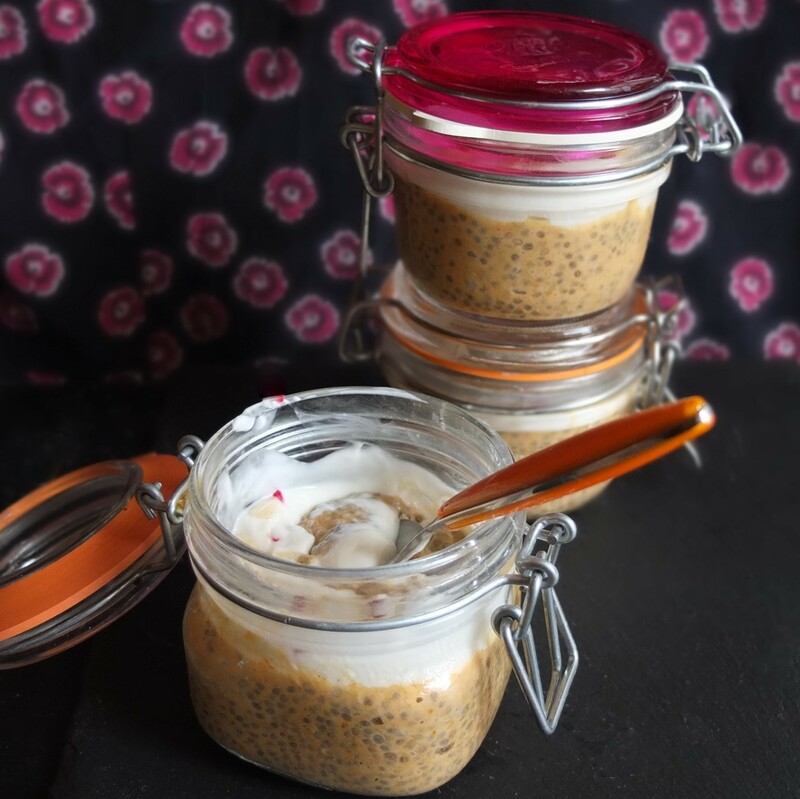 Make it in five minutes and leave overnight so the chia seeds absorb the liquid and become soft and gelatinous (it’s a kind of miracle) then enjoy for breakfast, tea-time or dessert. You may enjoy this delicious chia pudding more than a layer cake! Ahem? Anyway it’s a great option for eating between cakes… wink wink. 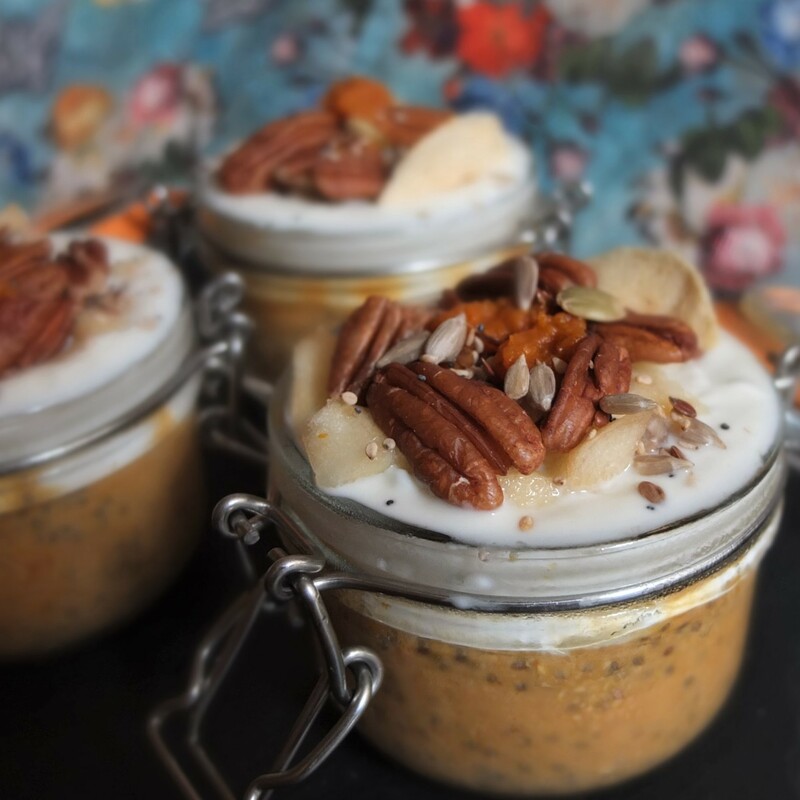 The pudding base is made with canned or fresh puréed pumpkin, almond milk and chia seeds. It’s flavoured with mixed or pumpkin pie spices and sweetened with a little pure maple syrup. 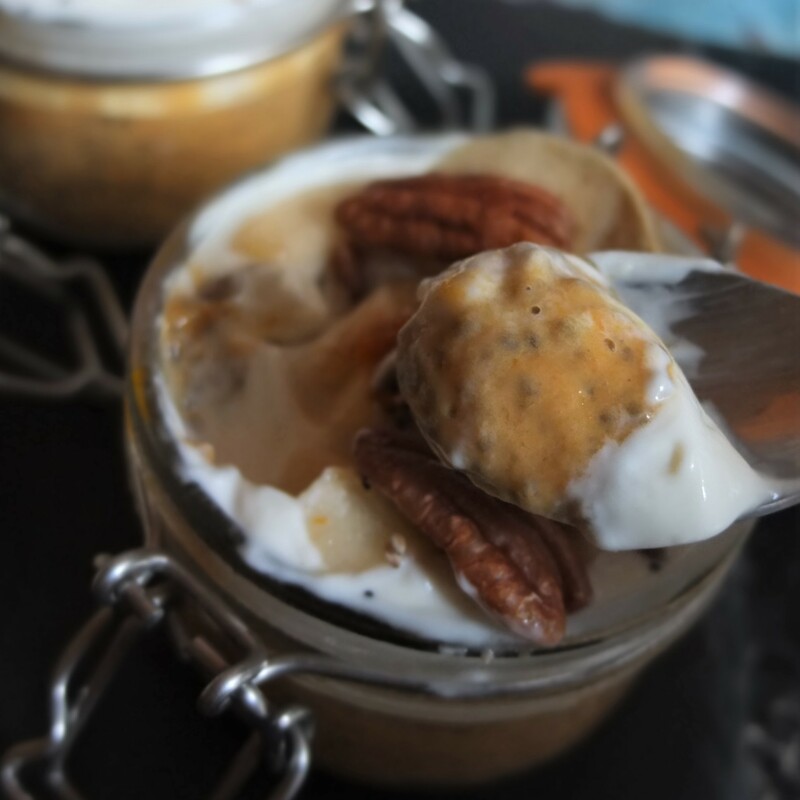 The optional simple topping of lightly sweetened high-protein and low-calorie skyr makes this pudding a little more special along with the chopped apples, pecans and a sprinkling of seeds. 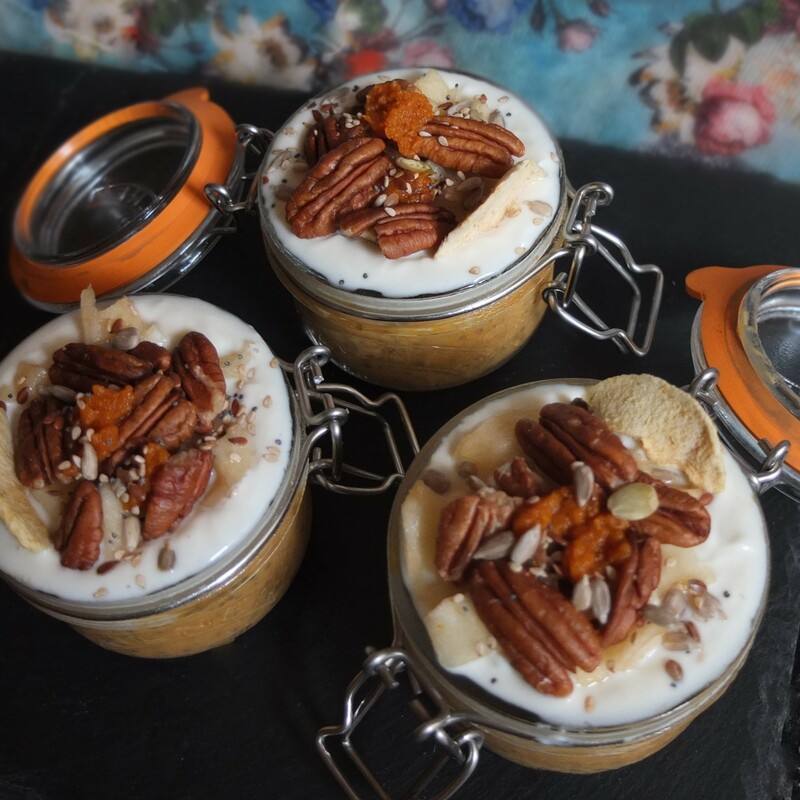 It’s a very flexible dessert so you can use vegan or greek yoghurt, coconut milk, dried fruit, walnuts, almonds… whatever you have at hand. There are photos below of various versions. 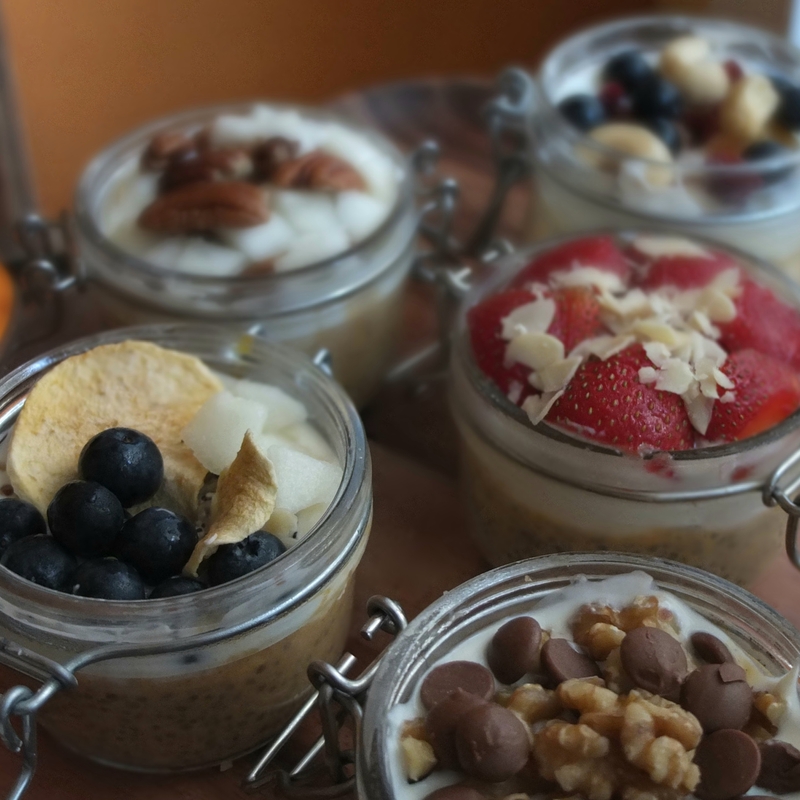 If you’re new to chia puddings then do give them a try. They’re light, refreshing and satisfying with lovely flavours in a puddingy gelatinous and creamy texture. 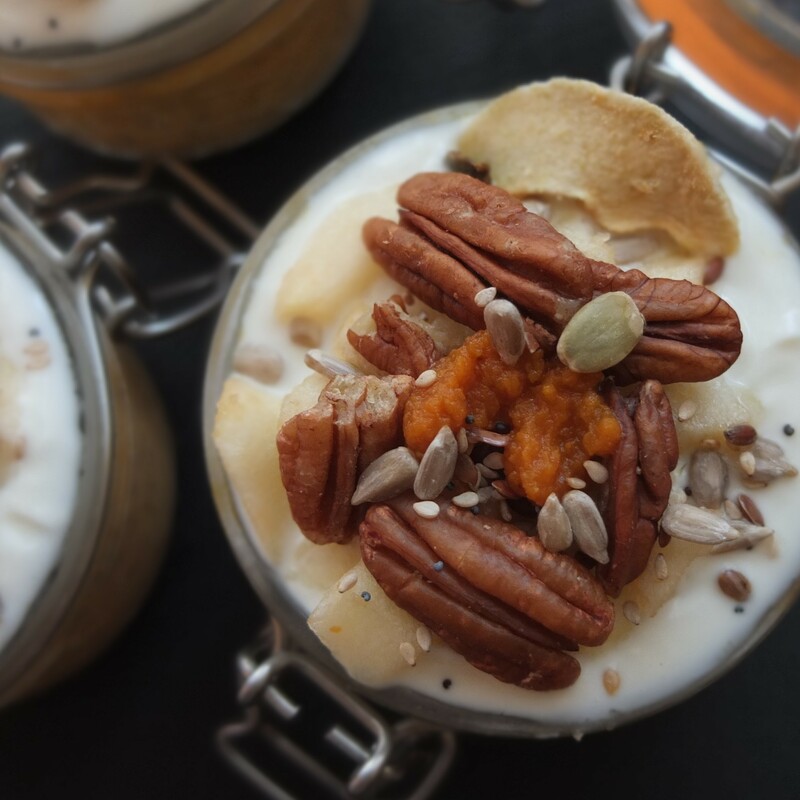 So let’s welcome in the new season with some autumn pumpkin chia puddings! The first ones had flaked almonds and freeze-dried raspberry pieces. Yum. They’re nice plainer with hardly any extra toppings. The other varieties were all yummy too. It’s down to what you fancy or have in the kitchen. The strawberries and blueberries are lovely but overpower the pumpkin a little while the chocolate drops and walnuts make a change playing along nicely with the flavours. Finally I researched suitable combos for pumpkin in Niki Segnit’s Flavour Thesaurus which came up with apples, mixed spice, almonds and walnuts (couldn’t resist pecans instead). The apples can be dried or crisps and caramelised ones could be oh la la! Mixed seeds lend a little crunch. It’s worth playing with chia puddings so they’re interesting and keep you wanting to eat them cause … they’re good for you! For the latest Autumn puddings I was running out of chia seeds so had less than usual but it was still great. Increasing the quantity of pumpkin ensured extra flavour plus there’s a little dollop on top for good measure. Nice. For tips and more chia pudding variations see this interesting Wikihow article at https://m.wikihow.com/Make-Chia-Seed-Pudding. 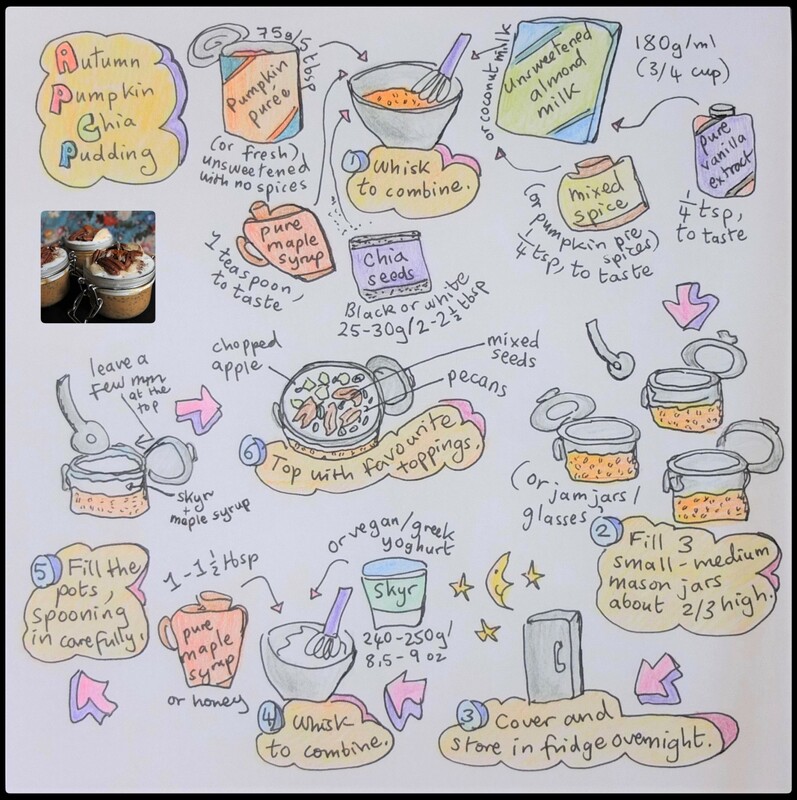 Keeps well in the fridge to eat within 2 – 3 days (okay for a few extra days but stir a little). 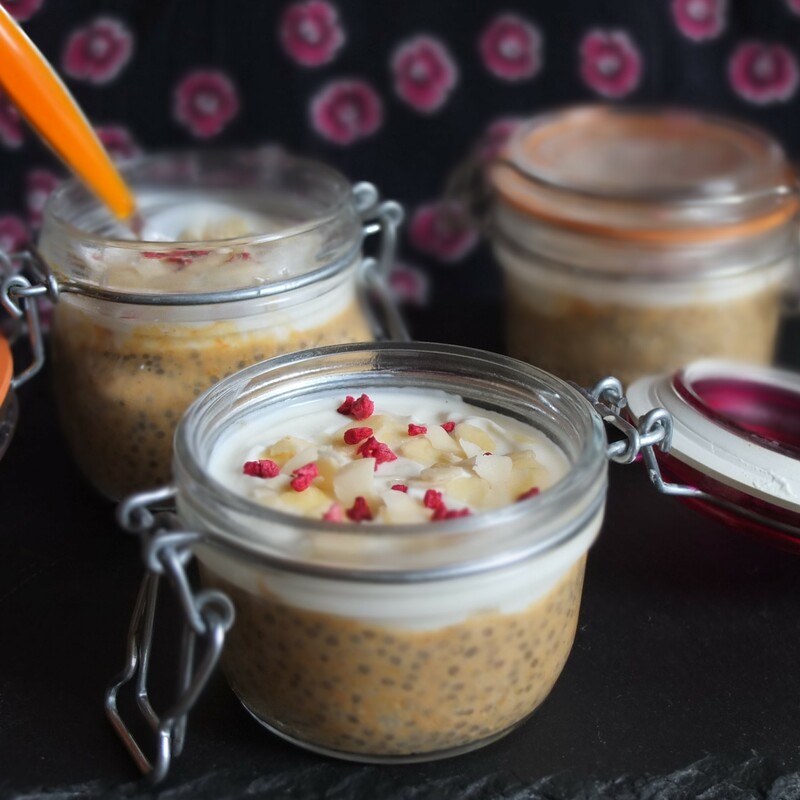 Nice yummy autumn pumpkin chia pudding.